The recovery after meniscus surgery can vary significantly. 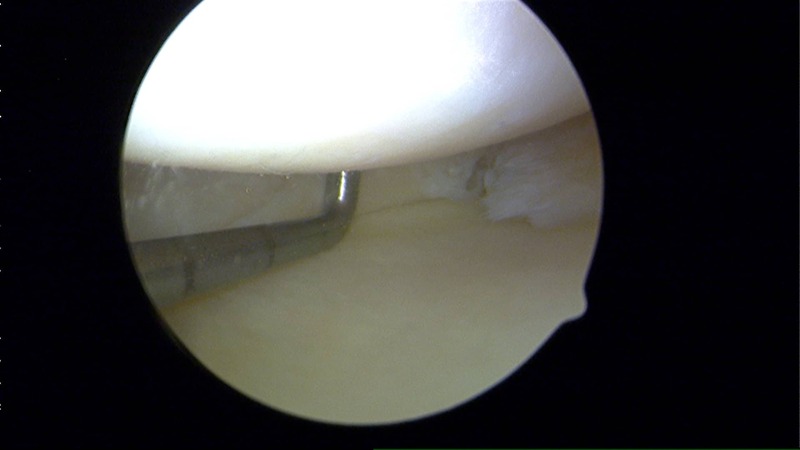 The recovery from an arthroscopy for a meniscus tear may take a bit longer than you anticipate. Your recovery after knee surgery may be straightforward or for some it may be more complicated. Recovery is dependent on a number of different issues. The time is takes to bounce back from meniscus surgery will vary because of the type of tear you may have. Your recovery will also depend on whether or not you had a meniscus repair (sutures) or if you simply had the torn pieces removed (partial menisectomy). 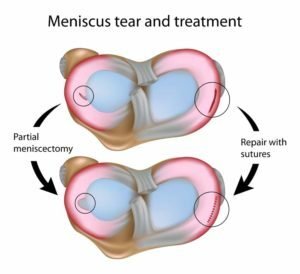 In some cases the recovery from meniscus surgery is measured in days t0 weeks, and in cases of a meniscus repair might take a few months to recover fully. For most, recovery from meniscus surgery is generally a straightforward process. People like to compare themselves to others and wonder why they may not be progressing as well. There are many potential issues at play which can affect your recovery. First off, as stated elsewhere on this site, not every torn meniscus will require surgery. However, if in fact yours does, then you’re probably wondering what to expect in terms of your recovery from meniscal tear surgery during the days and weeks after the procedure. The issues that will affect your recovery from meniscus surgery include some variables which are under your control, and some of which are under your surgeon’s control. Preparation: The concept of recovery begins before surgery. Prehab, or physical therapy before surgery could be important. The stronger your leg is and the more flexible it is prior to surgery the easier your recovery might be. Controlling pain after surgery is also critical to proper recovery after meniscus surgery. Things to consider having at home to improve your comfort and recovery include an ice compression sleeve ,or a knee compression sleeve to wear throughout the day, and supplements to minimize inflammation. There are many factors that will determine how quickly, or completely you recover from your meniscal tear surgery. Key elements include your age, weight, and activity demands. The older you are, and the heavier you are, the longer your recovery will be. The type of surgery you had will also impact upon your recovery. In some cases we only remove the torn piece, that procedure is called a partial menisectomy. In general you should progress faster following a partial menisectomy than someone who had sutures placed to repair the meniscus tear. That’s because a repair might take longer to heal. If you have osteoarthritis and a meniscus tear you should anticipate a more rocky recovery. Arthritis found at the time of your meniscus surgery will also significantly influence your recovery following an arthroscopy. If you have arthritis then you are missing some or all of the cartilage on the ends of the bones. Knees with arthritis are prone to being more “cranky” during the recovery process. In those cases, an ice compression device can provide temporary relief of pain/swelling. Many patients note they also feel better wearing a compression sleeve during recovery. People with arthritis sometimes report improvement in their symptoms with supplements like Glucosamine, Curcumin, or Hyaluronic Acid which they believe (not proven) will smooth out the surface of the joint. Many try Tart Cherry juice because of its natural anti-inflammatory properties. It should be noted, as mentioned elsewhere in many post on my site surgery for a meniscus tear in an arthritic knee is rarely worth the risk. Some of the variables affecting your recovery from meniscus surgery are under your surgeon’s control. We can improve your immediate response after surgery with the use of various medications we inject within the knee before the surgery. We can also block a nerve on the side of your leg which will improve your pain for 18-24 hours after surgery. A knee brace can be protective after surgery and make the knee feel more stable. Perhaps the best predictor of who will do well after surgery is proper patient selection. Meniscus surgery in patients who are obese, have arthritis, and poorly controlled diabetes tend to do very poorly after surgery. In general, young, healthy active people with no evidence of osteoarthritis will experience a much more rapid recovery. In many cases the knee will feel better within a few days. Most people are off crutches in a day, and stop taking pain medicine within a day or two. In contrast, if you are a older, heavier and have arthritis as well as a meniscus tear, then you may take much longer to recover. 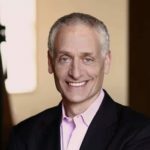 In addition, is you have had a partial menisectomy and also have osteoarthritis you may not experience a “full” recovery. Discussing the realistic goals of surgery with your surgeon is critical here. You may think that you will be able to return to running 8 miles a day. That might not be your surgeon’s goals for you. Be sure to dive into this before having surgery. To ensure a good response to surgery, we also need to look at your health before surgery. Smoking leads to an increased infection rate and poorer healing. Diabetics with poor sugar control are at higher risk for infection and delays in healing as well. Obesity is a potential problem with anesthesia, the recovery from surgery and it may lead to more rapid progression of arthritis after surgery. The better shape you are in prior to surgery will have an influence on your recovery. You may like this video on recovery from meniscus surgery. After surgery you may be hesitant to get up and move about. No matter how hesitant, you should actually be encouraged to move around as much as tolerated. This is important because it minimizes muscle atrophy, minimizes the risk of blood clots, and helps your lungs recover from the anesthesia. However, there are also some limitations to be expected. For example, if you had a meniscus repair surgery we may ask you to use crutches and avoid deep squats or pivoting and twisting on that leg for a few weeks. But if you simply had the piece cleared out of the knee, then you can resume fairly normal activities as tolerated. Consider a cryo cuff and compression sleeve to minimize swelling which will improve your motion. Once cleared by your physician, certain exercises are helpful for recovery. Be sure to check with your physician first — then you will find these videos on quadriceps knee exercises and these hamstring exercises useful. 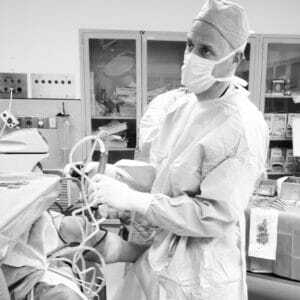 If I operate on 10 people on the same day for the same problem, I will hear about 10 different responses and recovery rates when I take your sutures out a week later. So, don’t push it… when your body is ready to resume activities after meniscus surgery you will know. Most important of all… listen to the instructions given to you by your surgeon. 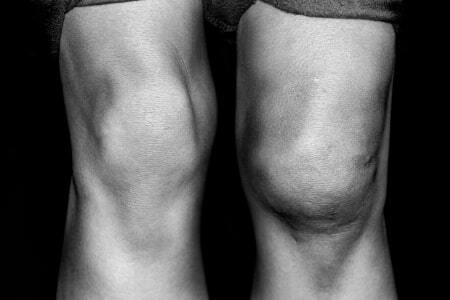 What Types of Meniscus Tears are there?